"41UR315, Burial 27, Vessel 141" by Timothy K. Perttula and Robert Z. Selden Jr.
DECORATION (INCLUDING MOTIF AND ELEMENTS WHEN APPARENT): The upper rim panel has three horizontal engraved lines on it. The lower panel has a negative sideways-shaped S-shaped scroll that is repeated four times around the vessel. The upper and lower scroll zones are filled with rectilinear and curvilinear excised areas as well as two short vertical engraved lines between the excised areas. The outer part of the excised areas has upper and lower spur elements. Ripley Engraved, var. 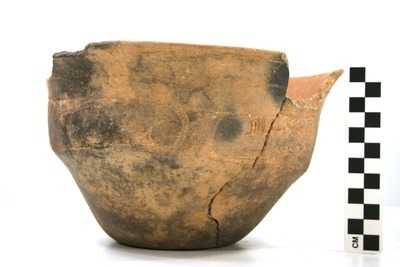 Gandy compound bowl, Vessel 141, Burial 27.